Amateur radio has a couple of sweet allocations in the VHF bands, but because the signals don’t reflect off the ionosphere like shortwave signals, the use is limited basically to line-of-sight. One workaround is to use a repeater with a tall antenna, but that requires a lot of infrastructure or a mountainside lair. What if you could just fly your antenna up in a drone? Well, for starters, you’d run out of batteries pretty quickly unless you could power it remotely. And if you try to tether it, the supply wires end up being too heavy to lift. Or do they?!?! This is where our story gets strange. [Glenn, n6gn] has built a rig that transmits significant power over distance using a very thin wire. The trick is to send the power at high-frequency down the wire, at which point it becomes more like a transmission line than a conductor. (We’re not 100% on the physics here.) The signal is rectified to DC on the other end and, in this case, used to power the quadcopter. Check out the video (embedded below) where [Glenn] walks through an early test setup. [Glenn] isn’t quite there yet, but he’s been able to send almost 200 watts down 0.32 mm wire and he’s proven the basic principles of operation using balloons for lift. There are a few PDFs that get into more detail on [Glenn]’s website, and some of them are reprints of his articles in the ARRL’s QEX journal of experimental ham radio projects. These experiments are all conducted with ham-friendly parts and cardboard, so there’s nothing stopping you from trying this out yourself. Thanks [Martin] for the tip! > the use is limited basically to line-of-sight. … exactly like your VHF TV is always 100% line of sight. Except it’s not. Diffraction and reflection do play a big role in terrestrial VHF. Well, diffraction and reflection do play a big role, but line of sight is strongest. Maybe 20, 25 years ago, I saw a project at a military lab about using high voltage up a thin tether to power aerostats- I wonder about the pros/cons of the HVDC vs HF. Considering the height and power output of a TV transmitter what you get is pretty close to line of sight. Sure it works in buildings or whatnot but it won’t work in a valley or behind a mountain. that is using the “G” line, named after a Frenchman named Geroeau or something like that. you use a tapered “launcher on each end and its almost lossless. I read about it years ago, it always seemed interesting. The trick to sending this amount of power through a thin cable is high voltage. There is no way around that. The high frequency AC (instead of high voltage DC) is mainly to reduce the size of the electronic required to reduce the voltage (and increase the current) at the destination. In a drone you need a very lightweight power electronics, and the smallest possible size is inversely proportional to the frequency of the AC. Even at VHF it’s all skin effect. The copper is just keeping the phase aligned and in that way it “guides” the wave (or skin effect) to the destination. You could break the wire in the correct wave length segments and it would still work. For that matter, if you could “guide” the wave well enough you could completely do away with the wire and just use antennas but the the issue is tracking. A Tesla coil built with its top load capacitor being a matrix of spheres hollowed out to a scale and put in what amounts to a virtual cavity. Producing a lens like effect on the wave. Lowering the output frequency and producing a directional field. The real trick is having that wire running straight up into the air where there is good ventilation and thus effective cooling…. Wouldn’t want that much power running through that small of a wire inside my house. No, the trick is (if I’ve understood it correctly) that the power is running through free space *outside* the wire. That’s why the instructions advise you to keep it in a straight line away from things. It’s effectively a radio transmission between the two horn-shaped narrow-focus antennas, with the wire functioning as a guide. I think that you have this EXACTLY correct, Sir! I wonder what the advantage of a drone lifted antenna might have over a balloon or kite lifted antenna? I once chatted with an old military radio contractor who talked about antenna systems they used in the 60-80s. He spoke of a HF or LF (I can’t quite remember) phased array system that used a series of balloon lofted antennas, since they needed them somewhat mobile and removable. Some googling points out G4VGO’s site on qsl.net, http://www.qsl.net/g4vgo/antenna1.htm where he talks about balloon lifted antennas for HF use. I don’t see any advantage. I see technological masturbation for it’s own sake. Maybe the HV transmission is more the story though. Useful to power balloon lofted equipment. I see loads of advantages. What’s the advantage of a drone over a balloon? 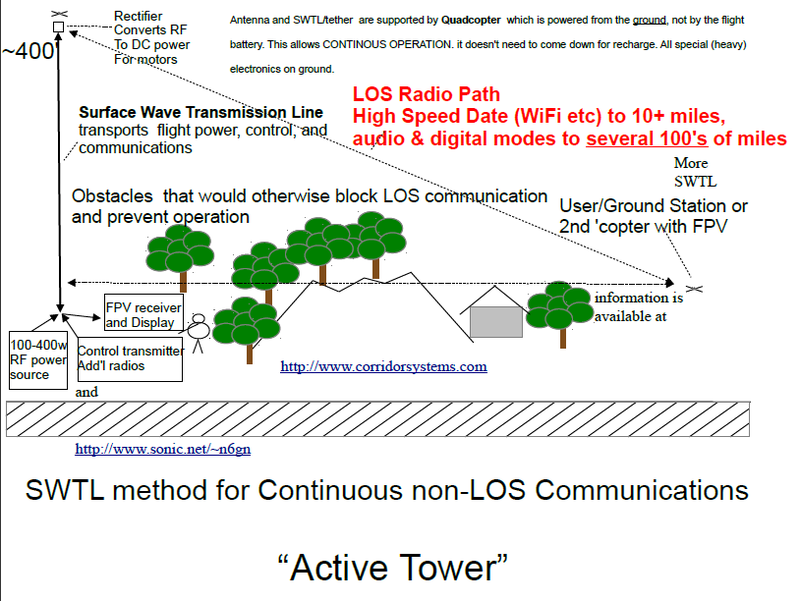 I mean, aside from maneuvrability (“a little to the left reception is better” <- realistical scenario in a large scale fading environment), wind-counteracting, and the resulting ability to fine-align a whole grid of antennas, or simply to have the option to rotate the polarization of the antenna? Not practical unless you have a pretty damn big drone. Average blustery fall day it will be all over the place, multiple ones for an array will just end up taking each other out. Yoke tether on a balloon, and walking it into position would be more effective. Why not combine the two? make a tethered blimp of some sort, so you get the sustained flight of a balloon, and some maneuverability of a drone. 600ft invisible tethers? I hope these are getting approval and going into NOTAMs so other low flying pilots can be made aware of them. Do pilots really belong within 600ft of people’s houses? Yes, the FA owns the airspace 500′ above ground level in most places in the US and it’s completely legal to fly in this space. You can be prosecuted for violating this without the proper authorization. 12 mil wire aren’t going to do any harm even if one were to fly into them. Do you think you could get 1.21 gigawatts through this thing? I need to know before tonight’s storm. The only way to *capture it* would be with a camera … arrrr, look, your drone and wire just turned into photons. Hmmm – just curious. FAA Part 101 regulates balloons, including tethered flight. What regulates tethered flight for denser-than-air rigs? Do the regulations anticipate this? I’m just curious… not likely to do it. I just like the spaces where regulation fails to keep up with technology. 101.7 Addresses moored flight & basically says don’t drop things or create hazards that could damage other peoples property. 101.19 Begins to address safe flight of moored balloons & requirement of a way to deflate it if it slips it’s mooring, Also notifying ATC if it doesn’t deflate. A beacon light like on radio towers would probably be required for long term moorings. Kites are included in their definitions of moored flight. A really creative idea! I like it very much. Even if the HAM use might be a rather special one, maybe it could be of use for general drone tethering. There certainly went a lot of thought into it. Btw, in regard to the physics: It’s a dielectric surrounded conductor. As such, the surface wave speed is reduced over free space speed, continously bending the wavefronts inwards and keeping the energy close to the wire. Just use a hydrogen blimp instead of a drone. Apparently bare optical fiber also works quite well for energy transfer. http://lasermotive.com/technology/power-over-fiber/ More expensive transmitter and receiver, but the tether is lighter and won’t attract lightning. CyPhy already makes tethered drones and can transmit 800W. See http://cyphyworks.com/technology/ or US patents 7510142 and 7631834. That camera idea sounds like a perfect application. Imagine setting up a string of such “towers” along the path of a cross country race track or similar sports events where something more permanent is not possible, and more massive temporary towers would be more expensive so you could afford less coverage than with tethered drones. 4K camera gear is getting very compact, you could have fixed angles from more than one camera that overlap then use a VR like system to track and zoom a virtual camera to follow the action. There might be “some” RF coming from it – but it’s all relative. In this case relative to a un-sheilded conductor 600 feet long. So yeah, I’m guessing their might be some questions. That is very ingenious, but couldn’t you just have a RF beam from the ground directly below a conical Mylar balloon containing helium, with the point downward? Using a three point anchoring scheme for positional stability. Make the slope of the cone nonlinear to control the amount of power reflected back to the ground over different distances, also accounting for the curvature of the Earth. I’m not sure if there is a ready made (FOSS) design tool for this, to calculate the geometry of the reflector by reverse ray-tracing back from a target geometry to a source. Does anyone know of such a specific software tool to do this? In the case of the cone you can reduce the dimensions required as it has rotational symmetry, but a full 3D tool would be handy, then you could design a reflector to maintain a beam an send it off at right angles from the balloon reflector with whatever spread you desired. e.g. You want to communicate with stations to your north, but not in other directions.